Tuesday was a wet, windy and cold day in Charleston. Heavy rain meant that play was delayed by three hours but thankfully, the rain passed and all the matches on the schedule were finished. It was another successful day for the seeds with no major surprises. 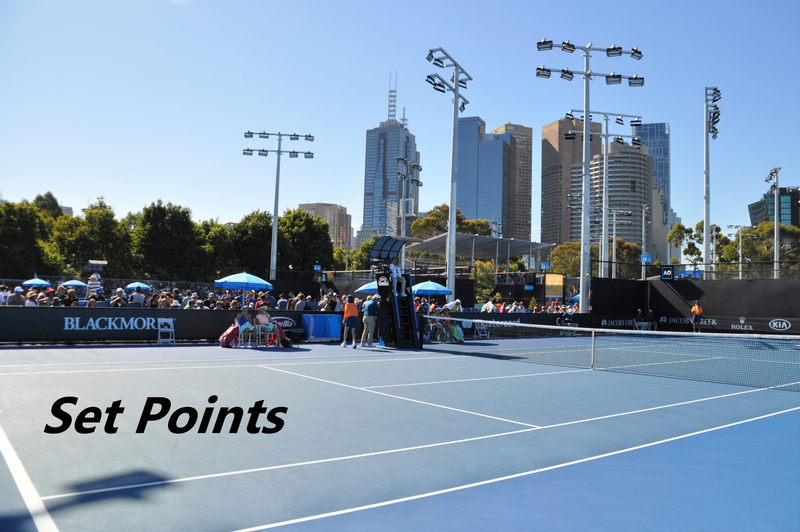 Read on for the highlights from day 2 of main draw action at the Volvo Car Open. In a topsy-turvy affair, the number 16 seed, Petra Martic beat Amanda Anisimova, 6-4 2-6 6-1. Anisimova took some time to adjust in the first set, both to the conditions and Martic’s variety. As the sun came out in the second set, Anisimova settled down and had joy going down-the-line with the backhand and a series of delicate drop shots. Martic didn’t hold serve in the second set. At the start of the third set, it felt Anisimova had all the momentum. However, the 17-year-old American was unable to seize on a potential opening to break in Martic’s first service game of the decider. From there on, Anisimova’s game rather disintegrated. Martic found her serve again and Anisimova lost all rhythm on her normally potent backhand, going down quickly with a bizarre double fault on match point. A disappointing end to the match for Anisimova who looks to be a little low on confidence. I keep having to remind myself that she’s just 17 and not to expect so much. A good win for Martic having lost to Anisimova in Cincy last year. Petra played some good stuff in the first and third sets will always be a tricky customer on the clay. Through the first two days, all ten seeds in action have come through unscathed. In the first of the second rounders, The number one seed, Sloane Stephens survived a wild match against Sara Sorribes Tormo, edging two tiebreak sets, 7-6(4) 7-6(4). While it was decided in straight sets, the match took two hours and 37 minutes! I watched the first set where Sorribes Tormo led 5-2. Stephens was noticeably more aggressive than usual, but she made some tactical errors and kept coming forward to the net where she didn’t look comfortable. After a changeover chat (Stephens opened with “it doesn’t get much worse than this” 😂) she played more focused. Sorribes Tormo’s serve (that’s one hell of a service motion) went off and she couldn’t keep the ball away from the Stephens forehand which began to click. Mihaela Buzarnescu won just her second singles match of 2019, recovering from 1-4 down in the third set to beat Magdalena Frech, 6-1 4-6 7-5. Buzarnescu had thrown in back-to-back double faults to surrender the second set. I think this was a big win for Buz. Since the injury in Montreal that completely snapped her momentum, the Romanian player has really struggled to get back to that form. Hopefully this win will give Buzarnescu a much-needed boost. Andrea Petkovic played a very steady match to turn the tables on Varvara Lepchenko from last year in Charleston and record her first ever win over the American player. Petkovic recovered from a break down in the second set and was always the more consistent player, playing smart in the cold, damp and windy conditions. Lepchenko started very slowly with sluggish footwork. While she did improve in the second set, Lepchenko was mostly error-strewn as a better-serving Petkovic prevailed in straights. It’s always nice to see Petko winning matches, especially in Charleston! Andrea Petkovic spoke about the cold conditions in her press conference. Enjoyed this article on Shelby Rogers who won her comeback match on Monday having spent over a year on the sidelines. It was sad to read of the moment when she picked up the knee injury in Indian Wells last year. Onwards and upwards, and hopefully Shelby can stay healthy 🤞. Tuesday’s forecast looks much brighter and so does the schedule with all the seeds coming out to play with 14 second round matches on the OOP. The only upset I’d probably go for is Petkovic over Sakkari. I think there will be more but tough to pick them out! Caroline Wozniacki will have her hands full with the Siege on clay although I was generally impressed with how Woz played in Miami. Tatjana Maria is all tricks so I think Madison Keys, who didn’t play well in IW and Miami, will have a tough match on her hands. Ostapenko-Rogers is an intriguing one. Ostapenko should come through but Rogers was excellent in her comeback match. Puig-Kenin and Mertens-Kanepi feel like 50-50 clashes, but not feeling bold to go with the upset. ← Monday’s Set Points, Charleston 2019: Welcome back, Shelby!